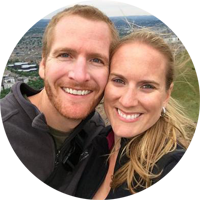 Though it doesn’t exactly feel like “just yesterday” when we boarded a plane in Los Angeles headed to Europe, it’s hard to believe that today is our 100th day on the road! In honor of today, we thought it would be fun to do a little re-cap and reflection of our adventures thus far, highlighting the good, the bad, and the yummy! 100 Days on the Road in Numbers! We have slept in 21 different beds including everything from hostels to bed and breakfasts, and also hotels, apartments, and friends’ houses. 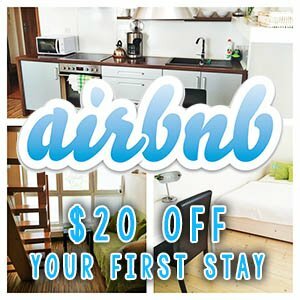 We’ve made pretty much all of our reservations through AirBnB and Booking.com. According to our pedometer, we have walked almost 300 miles (274 to be exact)! 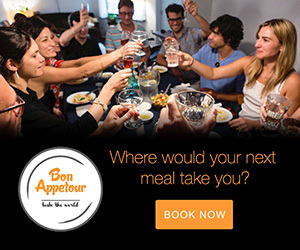 We’re averaging about $75-80/day, including transportation, food, lodging, and activities. Some days are more expensive than others, and a few sponsored stays have helped subsidize our expenses. Let’s Talk About the Good Times! If you’ve been following our trip, you’ll know without a doubt that Slovenia was our absolute favorite! As lovers of small town experiences and outdoor adventures, Slovenia completely won us over. It’s impossible to pick just one favorite view, and though there were many, here are two of our favorite views so far. A series of cable-cars took us near the highest point in the High Tatras mountain range. Our mouths hung open at the view of the valley of Malá Studená dolina, as seen from the peak of Lomnické sedlo. 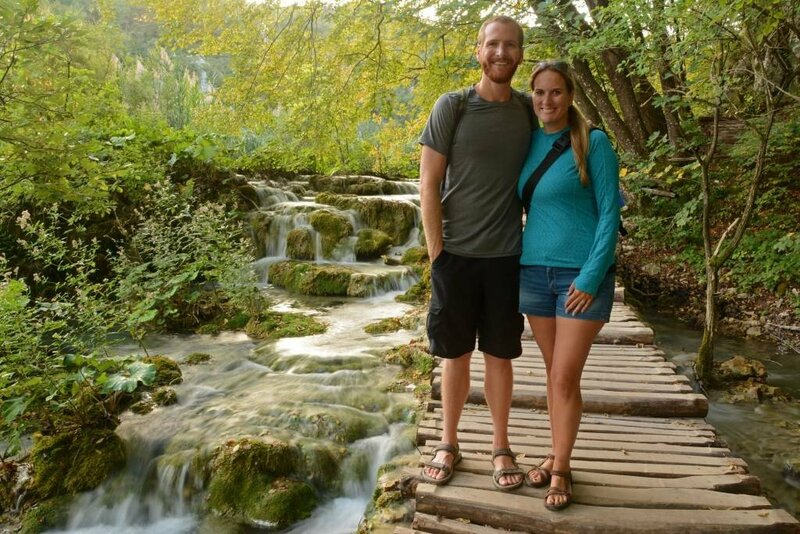 We found one of our other favorite views just last week at Plitvice National Park in Croatia. 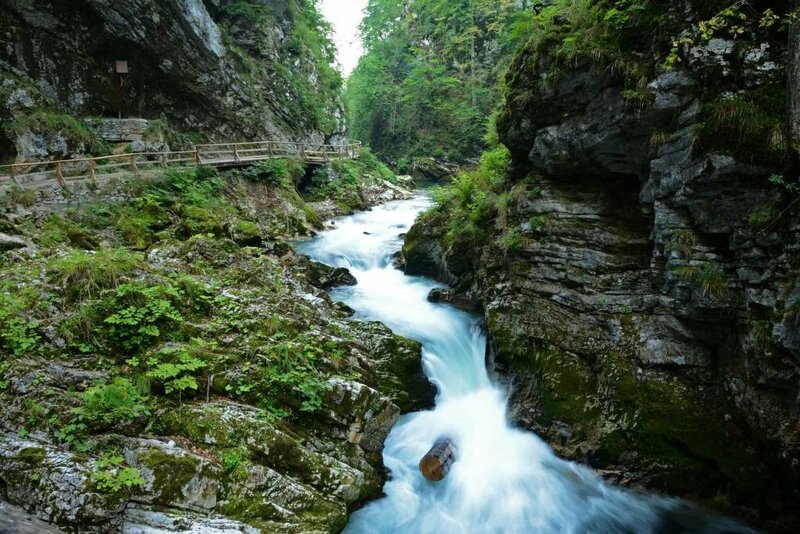 Miles of wooden walkways, gushing streams, and countless waterfalls created the most gorgeous scenery! There weren’t too many instances where we were up before the sun, so this wasn’t hard to narrow down. 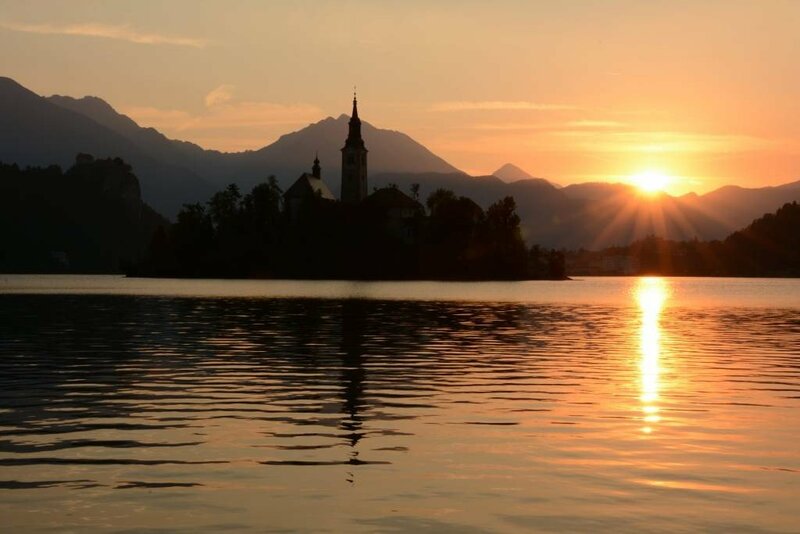 Our alarm sounded at 4 am the morning we planned to visit Lake Bled, and though we were bleary-eyed, we were ecstatic with the early morning outcome! 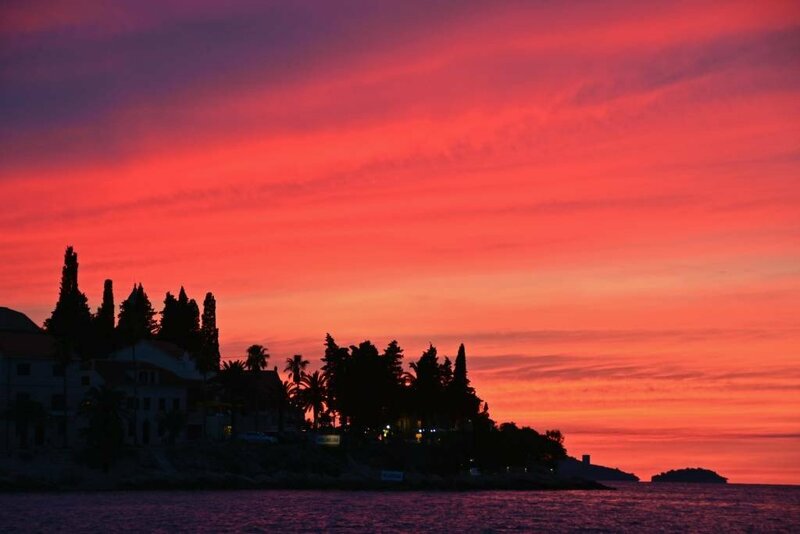 I don’t think we’ve seen a more vibrant sky than we did one evening while on the island of Korčula in Croatia. The sky started out looking like a pastel watercolor and within minutes had turned into the most beautiful painted canvas! The sky’s reflection on the water was absolutely brilliant! 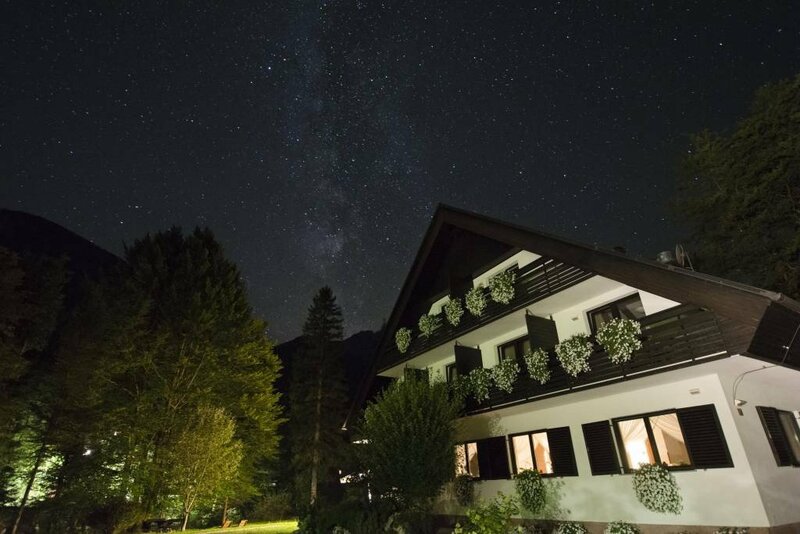 We absolutely loved Vila Park in Bohinj, Slovenia. In the middle of nature with gorgeous mountain views, a peaceful stream nearby, and a few minutes walk to the lake, it was the perfect place to unwind. The owner was extremely friendly and the breakfast served was one of the best on our trip thus far. Its location, so removed from any large town, provided a dark sky perfect for star gazing, spotting the Milky Way, and catching a glimpse of the Perseid meteor shower. 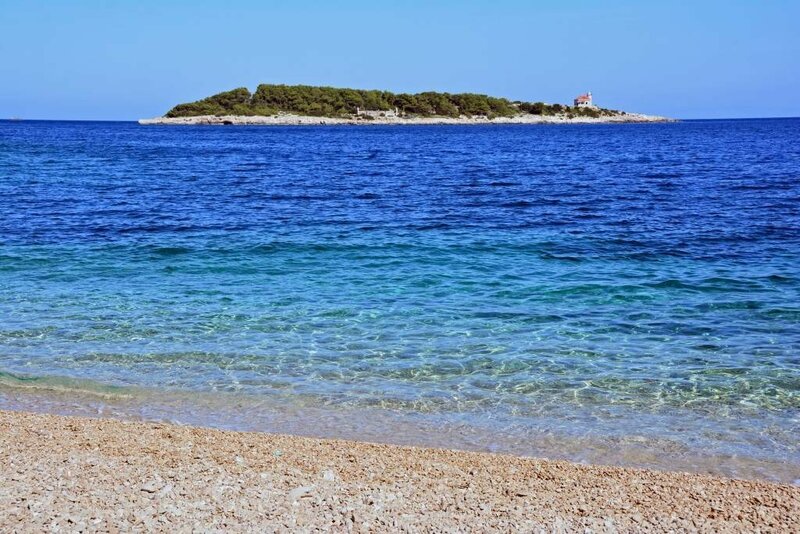 This was one of the first beaches we visited in Croatia, so we were blown away by the vibrant blue, crystal-clear water. Because it was located a little ways from the main village on the island, it wasn’t overly crowded and we felt like we almost had the place to ourselves. We also loved the (25-minute) walk between the village of Vis and where Grandovac was located, as it took us through other small villages with really neat and historic buildings. Let’s Talk About the Not So Good Times! Lack of Signs = Confusion! Knock on wood, we haven’t had too many travel blunders so far. Most people we’ve come across speak English. Signs are easy to read for the most part, and we did a good amount of planning for this part of our trip. I have a feeling we’ll encounter a few more blunders once we venture into Southeast Asia next month! 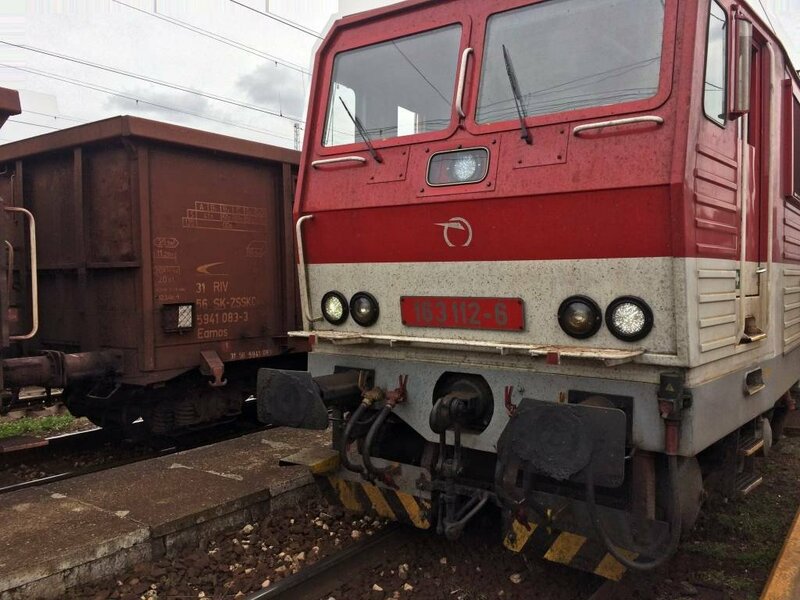 But, for now, everything has been fairly smooth sailing… oh, except for the time we got on the wrong train, going in the wrong direction in Slovakia. Fortunately, we only traveled 30 minutes out of the way in each direction and we had time to kill on the other end, so there were no major set-backs. The Bosnia & Herzegovina Border where we were just waved right through! 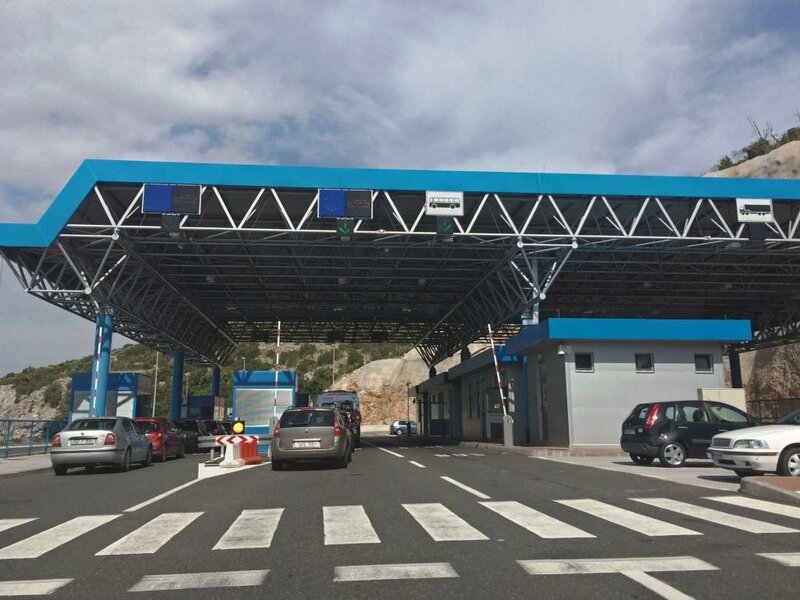 After getting ripped off by the cab driver who took us to the rental car location, we were hit with a surprise 50 Euro additional fee because we would have to drive through the country of Bosnia & Herzegovina (for all of 10 minutes) on our way from Dubrovnik to Zadar in Croatia. Turns out, there was no paperwork required at the border, or maybe the officers were just lax. They barely even bothered to look at our passports. We researched it later and most online sources said that the border crossing paperwork is completely unnecessary. Though we planned for a few hikes during our trip, we didn’t bring good trekking shoes with us. We didn’t feel it would be worth lugging around heavy shoes that we’d only wear a few times. 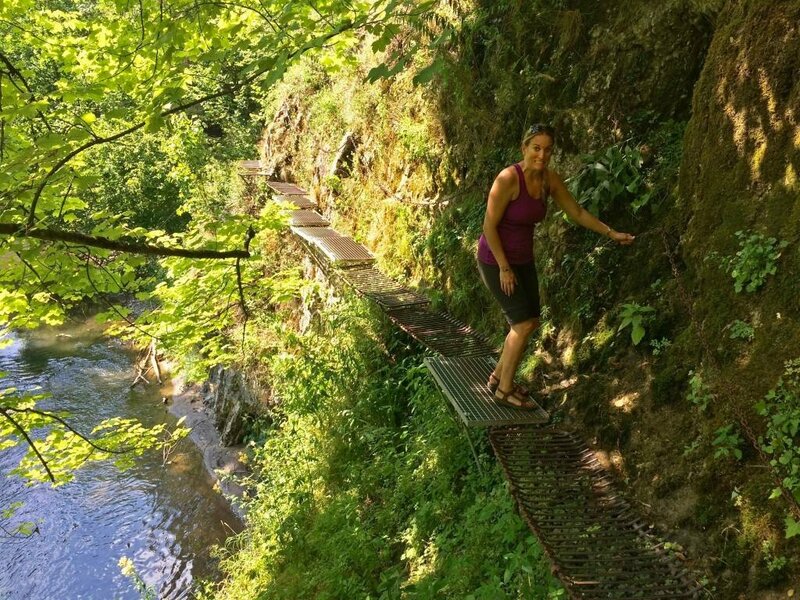 I was nervous about climbing the tall ladders on the Suchá Belá trail in Slovenský Raj National Park (Slovakia), but I really wanted to try. 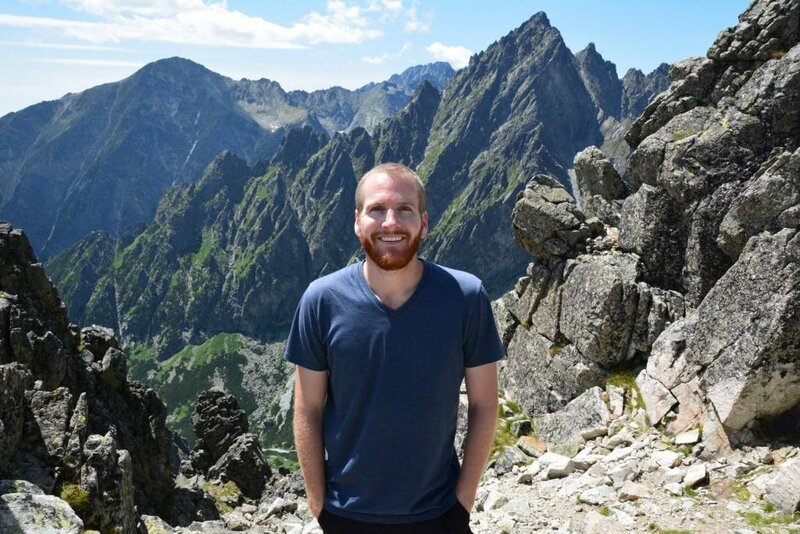 After slipping and falling on a wet rock while descending a mountain peak in the High Tatras earlier in the week, I felt a little less confident on my feet. We reached the very first ladder on the Suchá Belá trail and had to turn back. I couldn’t do it. Instead we opted for an alternative trail with no ladders, according to a park ranger. Uh… there were ladders, along with slippery rocks and metal grates bolted into the side of boulders. There was no turning back and it was truly terrifying! Another instance when hiking shoes would’ve come in handy… As part of a 3-day hiking holiday through the Salzkammergut region in Austria, we made the trek from Hallstatt to Gosau. 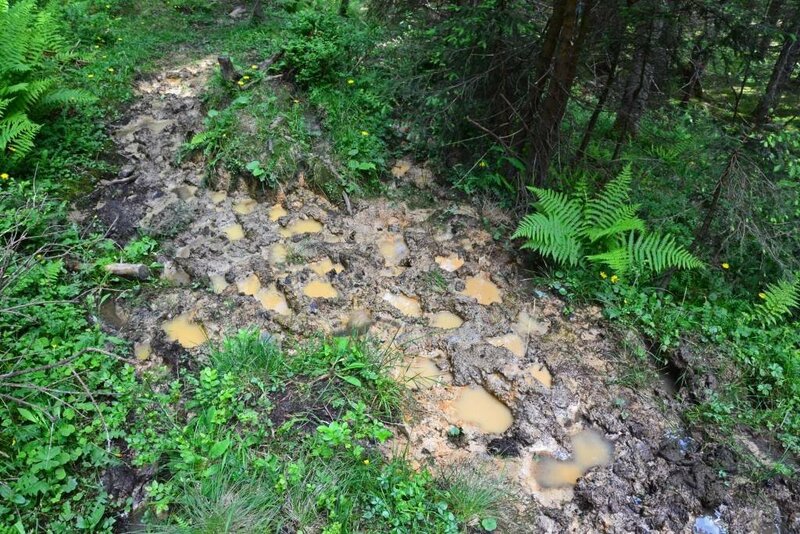 We were greeted with steep grades, hard to find trails, and mud… lots and lots of mud. What should’ve been a 5-6 hour hike turned into 12 and we couldn’t wait for the day to be over! There was cursing, there were tears, and did I mention… there was a lot of mud?! We’re fortunate that we haven’t stayed anywhere completely terrible on our trip thus far. Though trying to stick to a budget of around $40/night means that we’re not staying anywhere super glamorous, unless it’s a sponsored (free) stay provided by the hotel or local tourism board. Our apartment on the island of Korčula had 2 constantly yipping dogs upstairs and the hot water heater was located IN the shower, taking up half the space. 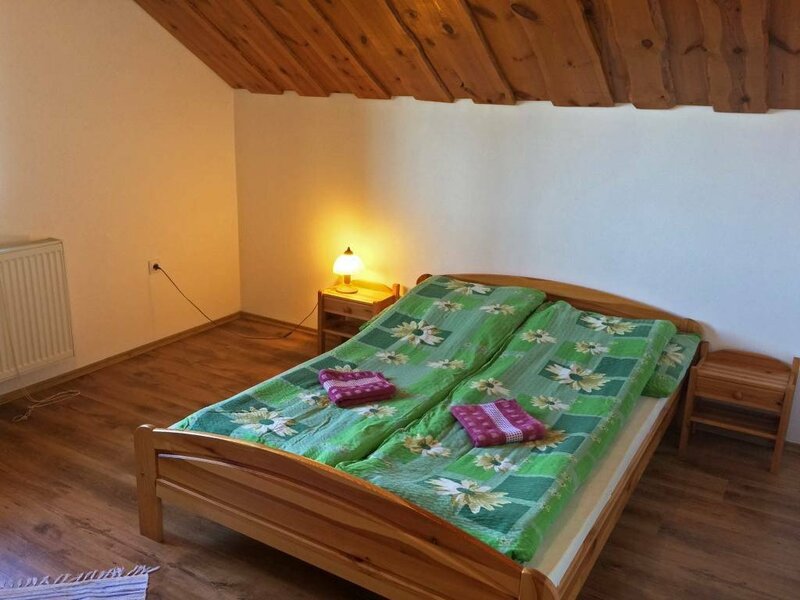 The bed in our apartment in Cesky Krumlov, Czech Republic was located in a loft, where we’d bang our heads on the slanted ceiling at the top of the stairs. A few of our accommodations were without air-conditioning or fan. If we ever wanted to open the windows (which never had screens), we’d be welcoming in the bugs. Some of the beds were too short and had foot-boards which wasn’t exactly comfortable for Sam, who is 6’4″. Rarely did we have a super strong WiFi signal, which was very frustrating. So, while each place had its pros and cons, there wasn’t any one place that we completely hated. Let’s Talk About the Foooooood! 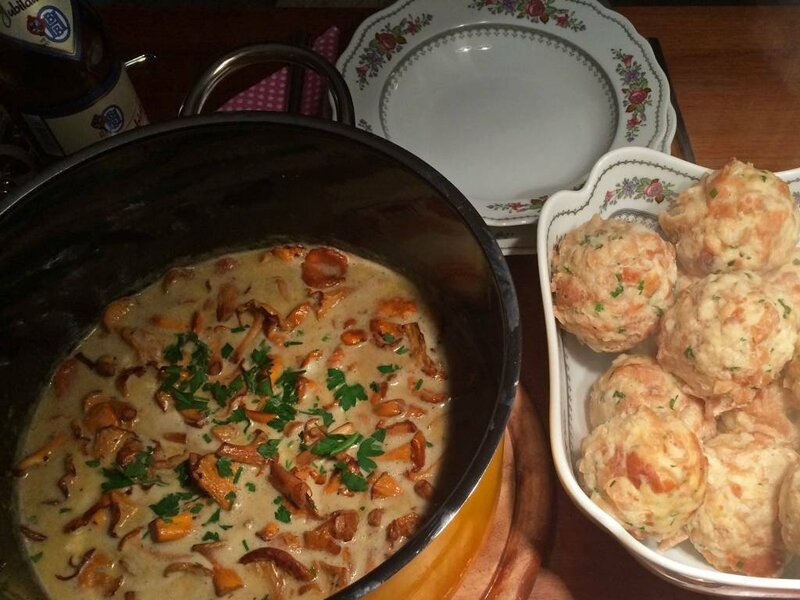 There’s just something about a home-cooked meal, so we have a few favorite meals, including our Dining with Locals experience in Budapest, hand-made pizza and also Semmelknödel mit Pfifferling with our friends in Berchtesgaden, and Sam’s home-made fresh fish dinner on the island of Korčula in Croatia. 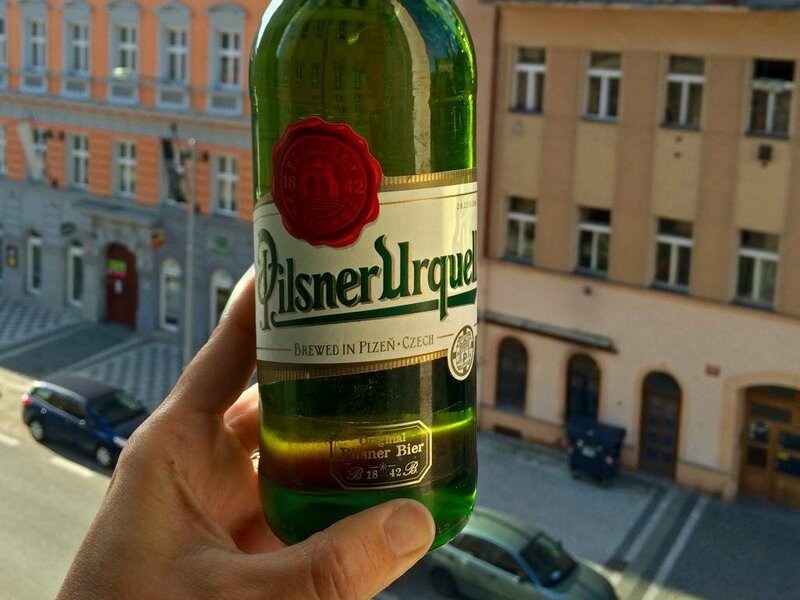 Pilsner Urquell – Good in the bottle, but best on draft! Sam’s first beer of the trip also turned out to be his favorite! Pilsner Uraquell, the original Pilsner, is brewed in the Czech Republic. My favorite beer was a cool, crisp wheat beer at Klasterni Pivovar located at the Strahov Monastery in Prague. So, Prague for the win! Though, truth be told, we’ve have some great beers in Germany as well and we’ll be sampling some more tomorrow as we attend Oktoberfest in Munich! Maybe it’s because we were in Italy, even though it was only for about 20 minutes, as we drove to and from Brda in Slovenia. 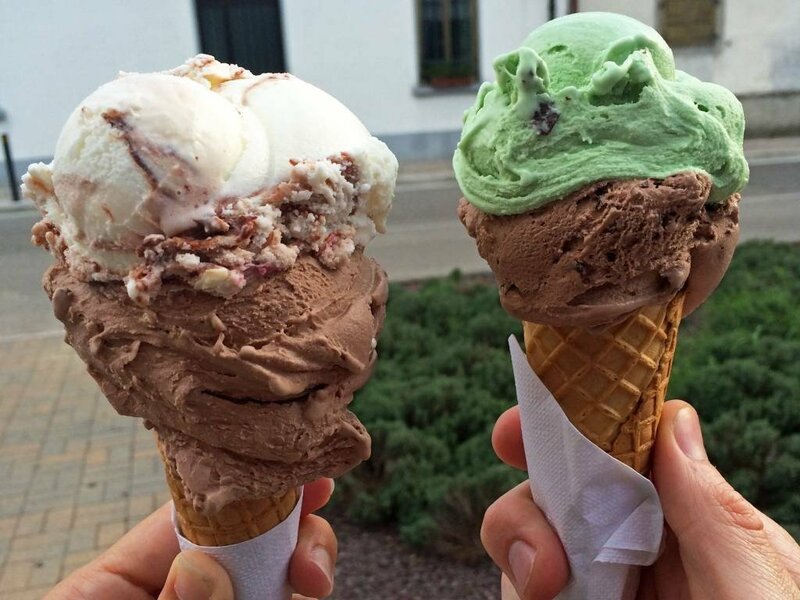 The gelato at Paradiso Dei Golosi looked so good that we had to get two scoops each, just to try multiple flavors. We’ve eaten a lot of gelato on this trip… some good, some blah, but this was definitely the best! Pošip- A delicious and refreshing Croatian wine – Goes great with fish! Being on a budget doesn’t allow for endless glamorous wine tastings and glasses of wine with dinner when dining out, but we certainly haven’t missed out on sampling local wines. Instead of tastings and glasses at restaurants, we go to the local grocery store and pick up a bottle of local wine. The only disadvantage to this is that sometimes we have no idea what we’re getting. Maybe it’s a wine we’ve never heard of or sometimes the description of the wine is in another language. We make our best guess, take a chance, and for the most part have pleased with our selections! 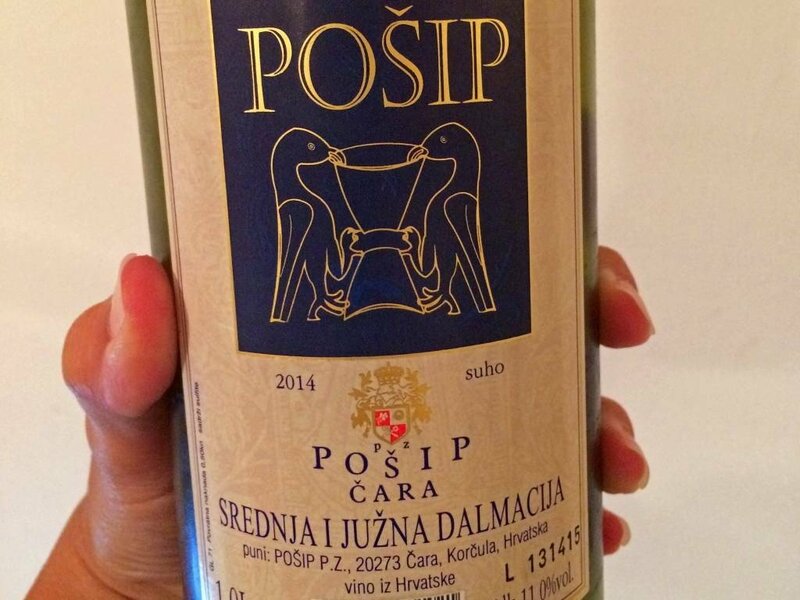 The best wine we’ve had to date is Pošip, made in the village of Cara on the island of Korcula in Croatia. Though we didn’t actually visit Cara, we sampled its wine… and it was delicious! Nothing like a tropical rum when relaxing on an island in Croatia! What we’ve been eating a lot of: Being on a budget has definitely dictated our food choices. While we’d love to eat out and enjoy the local food every day of our travels, we stick with what’s cheap! So, we’ve been eating a lot of pizza, pesto/cheese/tomato sandwiches, paprika chips, yogurt, smoothies, bananas, peaches, ramen noodles and zucchini. I’ve never really enjoyed Coke, I’m more of a Pepsi girl. However, we’ve actually been drinking the occasional Coke Zero when we need a caffeine fix (it’s best served with rum!). How our palates have changed: Sam is now eating tomatoes! I never thought I’d see the day! He also ate mushrooms the other night, which was a first. I have never really eaten much meat, only the occasional turkey sandwich or chicken pasta dish, but I’ve been steering clear of pretty much all meat on this trip. Toccara: Leaving behind a routine and the security of a steady paycheck was a big adjustment. I love not having to wake up ridiculously early to an alarm clock (most days) and just seeing where the day takes us. Some days we have a plan, other days we do not. Spontaneity has played out in our favor on more than one occasion, but other times lack of planning leads to stressful situations. I’m a little more nervous about the next leg of our trip, as we’re heading to SE Asia and don’t have much of a plan. Europe has been very comfortable and easy to navigate; I believe Asia will present a few more challenges, but we’re looking forward to a new adventure! Leaving behind friends and family has definitely been the biggest challenge of this trip. Though technology has been great for keeping in touch, unreliable WiFi has thwarted my Facetime dates more than once. It’s been hard missing weddings and birthday parties, but there are obviously sacrifices that must be made when choosing to ‘live’ halfway around the world. The views, memories, and experiences have been outstanding and we feel so fortunate to be on this adventure! Sam: I’ve always enjoyed exploring new places, so these past few months on the road have not been a difficult adjustment. It can be hard to strike a balance between too much time in one place and not enough in another, but I think we’re figuring things out as we go. The trip is becoming more fun with each passing day. You don’t really realize how much there is to see in this world until you embark on your journey. The hardest part of the trip has been leaving behind friends and especially family. Fortunately, this gap is bridged somewhat with video chatting, which we try to do at least once a week. We’ve met some good friends along the way and have connected with locals for some unforgettable meals. It turns out that people are the same everywhere we go, no matter the country. Sure there are grumps, but there are also genuinely kind individuals that make our world a little brighter. Discovering that we’re all similar has been one of the biggest eye openers of my life, and it has shifted my perspective in a positive way. We hope you’ve enjoyed following our journey… all of its ups and downs and everything in between! Can’t wait to see what the next 100 days have in store for us! 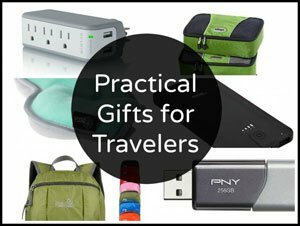 Disclaimer: Some of the links in this post are affiliate links. It’s of no cost to you, but using these links could help earn us a little extra revenue to put towards our trip! What do you want to know about our past 100 days on the road?! As Croatian, I must say I’m very glad you had some of the best travel moments while being in Croatia and that you discovered Room. 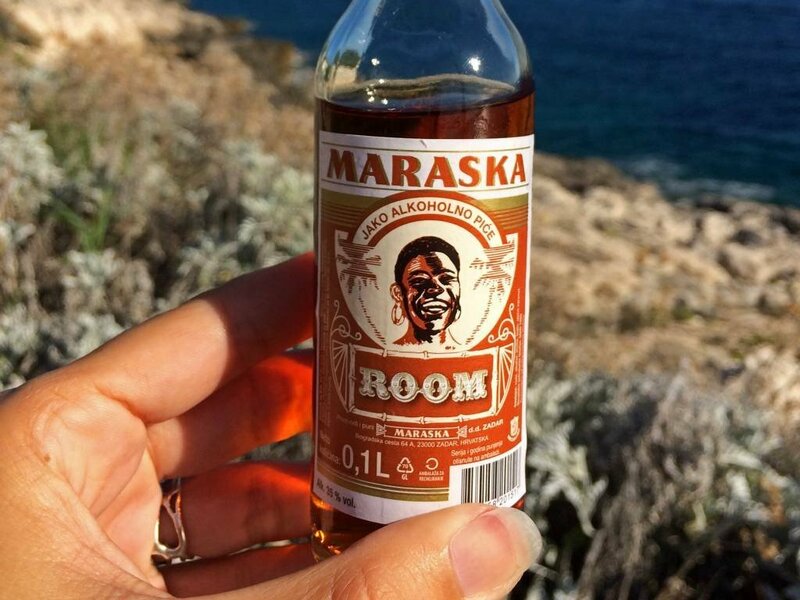 The thing is, it used to be called Rum, like actual Rum, but after a while it turned out it didn’t meet the quality standards to be named like that so they changed it to Room. In Croatia it’s mostly used as a cake flavor, only a few people that I know actually like it as a drink. Yes, we read it’s actually not ‘rum’, but more of a flavored liqueur. It was delicious nonetheless. Oh my goodness, this flavor would make an insanely good cake! I will have to try to sometime! I love this so much 🙂 I’m actually leaving today: Day 1. And I’d love to do something similar, thanks for the inspiration! It’s fun to see what you guys have done! Looks like lots of fun adventures! I love all the sunrise and sunset pictures! Best time(s) of day! 🙂 New beginnings and reflections from the day! I shared your website again today. Where we live now has a lot of traveling retired people. Also a lot of photographers. Enjoying your information, and pictures, plus videos! Thanks! Glad you’re enjoying our site! !